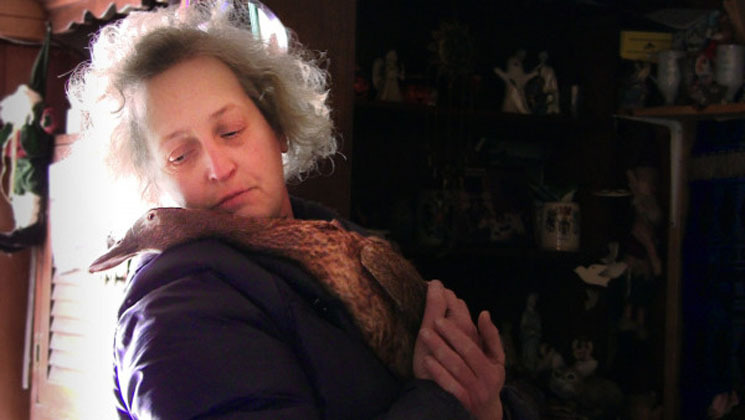 For the Birds begins with home footage of Kathy Murphy and her husband Gary with a single motherless baby duck they found in their yard, and want to take care of. Cut to ten years later, and their home is filled with more than 200 chicken, ducks and turkeys. With the vibe of a TLC reality show, an animal welfare agency steps in to relocate the birds to more suitable environments, but they quickly lose Kathy's trust. The situation escalates into a court case, and tensions between Kathy and Gary also mount to a breaking point. Director Richard Miron takes time to portray a clear and genuine love that Kathy has for her large collection of birds, as well as her desire to do what is right for their welfare. But for the most part, the documentary focuses on the drama of Kathy fighting with animal welfare and a marriage on the brink of collapse. It's suggested several times, but never officially confirmed, that Murphy has a hoarding disorder, and there is an uncomfortable question of mental illness under the surface. Brief moments, such as her husband remembering how their marriage used to be before the birds, ground the characters and adds real, human weight to their story. But these moments are rare, and not enough time is spent establishing context and backstory.